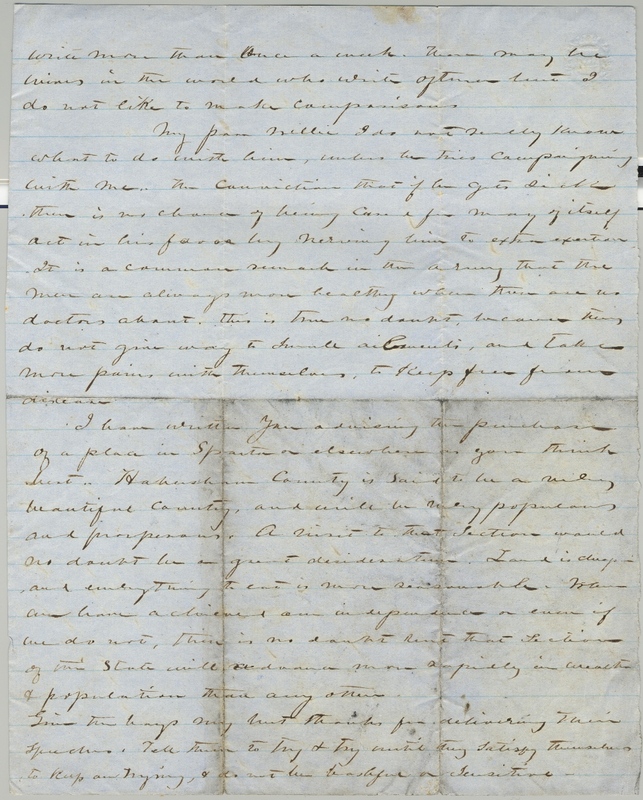 Item description: Letter, dated 2 June 1863, from General Lafayette McLaws to his wife. Your letter of the 24th was received yesterday. You have been a long time waiting for my letters. The principal delay is in the city of Richmond, but we are endeavoring to devise means to correct that evil. I have written to Wm R. to see the express agent in Augusta concerning the package with two hundred dollars. How did you get into the valise or satchel. The key was placed in the letter containing the money. I will send you some more money to Augusta Georgia to the care of Mr McLaws with the request that he forward it by private hands. Rest assured my dear exacting wife that if Colonel Jack Smith wrote to his wife twice each day & on one occasion a letter of sixty two pages, that he was perfectly worthless as a Colonel and resigned because he had been notified he would be dismissed for incompetency. He should be conscripted at once. I have written you every day but two, when not on the battlefield, and you do not write more than once a week. There may be wives in the world who write oftener but I do not like to make comparisons. My [pam?] Willie I do not really know what to do with him, unless he tries campaigning with me. The conviction that if he gets sick there is no chance of being cared for may of itself act in his favor by nerving him to extra exertion. It is a common remark in the army that the men are always more healthy when there are no doctors about. This is true no doubt, because they do not give way to small ailments, and take more pains with themselves, to keep free from disease. I have written to you advising the purchase of a place in Sparta or elsewhere as you think best. Habersham County is said to be a very beautiful county, and will be very populous and prosperous. A visit to that section would no doubt be a great desideratum. Land is cheap, and everything to eat is more seasonable. When we have achieved our independence or even if we do not, there is no doubt but that section of the state will advance more rapidly in wealth and population than any other. Give the boys my best thanks for delivering their speeches. Tell them to try and try until they satisfy themselves and to keep on trying, and do not be bashful or sensitive. My best love to Sister & Bet. I have written to both but no acknowledgement has been received. Good day and God bless you. Kisses to my little daughter and Uldrick. 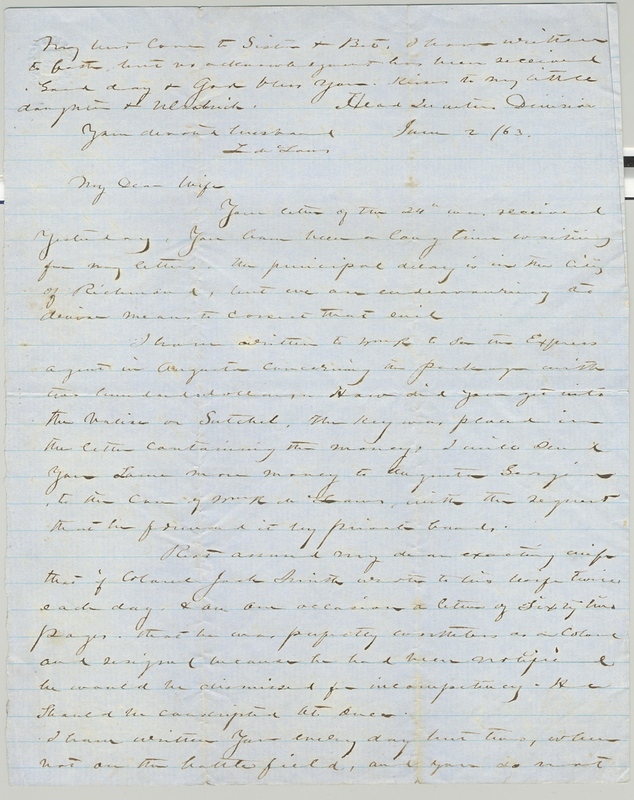 This entry was posted in Southern Historical Collection and tagged Augusta GA, disease, Georgia, Habersham County GA, illness, Lafayette McLaws, Sparta GA. Bookmark the permalink.